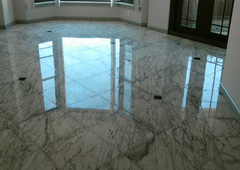 With decades of experience, we know marble and other types of natural stone better than most of our competitors. As master craftsmen, we understand and appreciate each stone's unique characteristics and our work produces stunning results. Our passion for what we do and a strong commitment to educate our customers on proper care and maintenance is evident in every single job we do. Classic Marble & Stone Restoration serves the Philadelphia Pennsylvania, New Jersey Delaware and Maryland areas and can repair, refinish, protect and restore your marble, granite, limestone, travertine, saturnia, slate, onyx or other natural stone back to its original condition. Your stone, whether polished or matte/honed, needs to be periodically cleaned and re-sealed by our professional technicians. In addition to stone, we also have extensive knowledge, skills, and experience servicing terrazzo and concrete. At Classic Marble & Stone Restoration, we not only perform these services, we can instruct you on the proper care you should use in cleaning your marble and other natural stone. We offer a full line of Care Products to assure you are using the proper cleaning product that will give your floors and surfaces the beauty you are looking for. Our founder, Carl Staples, is certified by the International Association of Stone Restoration and Conservation which merged with the Marble Institute of America. Carl was an instructor for and served on the board of directors of the International Association of Stone Restoration and Conservation. He's also taught the art of stone restoration across the United States as an instructor for the The Marble Institute of America and the National Training Center for Stone and Masonry Trades. I cannot say enough about the work performed by Pat Staples and her crew. We were very satisfied with every aspect of her work and would highly recommend her services to any home owner concerned with quality and integrity of Classic Marble and Stone restoration. We've been satisfied customers since 1990. Our home is full of marble, tile and granite floors and along with our 2000 square foot tiled garage...they all wait for Classic Marble and Stone Restoration every season to keep them in new condition!